The original Memorial Bridge, a through-truss lift bridge that carried US 1 over the Piscataqua River between Portsmouth, NH and Kittery, ME, was opened in 1923 in dedication to the sailors and soldiers of New Hampshire who participated in World War I. The bridge served commuters for 88 years before it was finally closed to vehicular traffic in 2011, due to structural issues that were common to bridges of this age. It was determined that the bridge was beyond a state of economical repair, and the replacement project began in 2013. Bridge replacement was carried out through a design-build contract with the selected team of Archer Western and HNTB heading up the project for the New Hampshire DOT and Maine DOT. 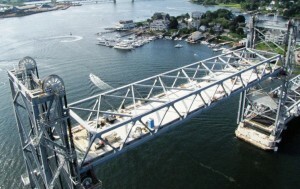 The new bridge design boasts a similar look to the old structure, yet incorporates many modern engineering innovations and efficiencies, such as a lightweight and durable Exodermic® deck. The strength of the Exodermic® system also allowed the design engineers to span the deck across floorbeams, eliminating the need for stringers which saved additional weight and cost. Not only was weight savings critical because it’s a movable span, but also due to the innovative construction method used to deliver the project. The 10,000 square foot lift span was completely fabricated offsite and floated into place to accelerate the project, which was completed one month ahead of the 19 month pledged delivery schedule. The modern design and creative delivery method shortened the construction schedule considerably, as typical projects of this magnitude and complexity often take months longer to complete. The BGFMA was a proud sponsor of the National Student Steel Bridge Competition (NSSBC), hosted this year at the University of Akron. Forty-seven universities from across the United States, Mexico, and Canada participated in the competition, which took place on May 23-24th. Only the top few teams from each regional conference were invited to take part in national competition, so great job to all of the teams that qualified. Special congratulations to the student team from the University of California, Davis, who was crowned the overall winner. This entry was posted in In the News, Primary on June 24, 2014 by Admin_RyanS. Why Specify BGFMA Member Fabricators? Quality – BGFMA policies require that fabrication be performed in the member’s AISC certified manufacturing facility. In addition to the stringent AISC certification requirements, members are also subject to internal audits conducted by appointed BGFMA representatives. Experience – BGFMA member companies employ individuals with decades of grid design, detailing, fabrication and installation experience which helps ensure the success of your project. Capacity – BGFMA members have the means to engineer and fabricate even the largest grid deck system projects. Members are also held to the highest standards for on-time delivery to ensure that construction schedules are not compromised. This entry was posted in In the News, Primary on June 23, 2014 by Admin_RyanS.